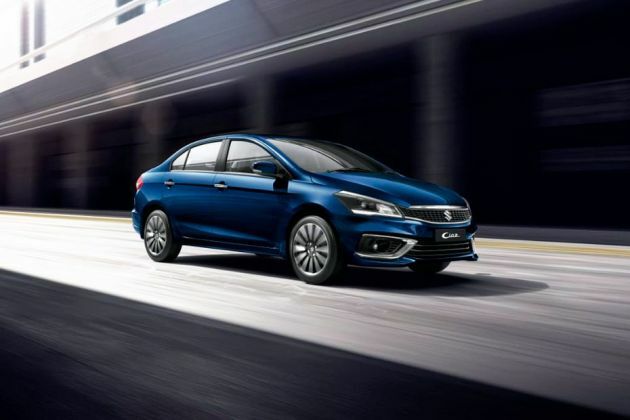 The wait is finally over for the most anticipated sedan Maruti Ciaz, as it has been officially launched in the market. This latest vehicle from MSIL is available in numerous trim levels with both petrol and diesel engine options. Among these, Maruti Ciaz VXi Plus is the mid range variant, which is powered by a 1.4-litre, K-Series petrol engine. It can belt out a maximum power of 91.2bhp along with a peak torque output of 130Nm. This mid range trim has several advanced comfort features including automatic climate control unit, reverse parking sensors, steering mounted audio controls and height adjustment facility for driver's seat. The car maker claims that this sedan is the longest and widest in its segment, which eventually provides an exceptional leg and shoulder space inside. It has an attractive external appearance owing to its sleek body structure and styling cosmetics like projector headlamps and a stylish radiator grille. This mid range variant is also bestowed with crucial safety features like ABS with EBD, driver's side airbag and keyless entry function, which makes it tough contender in the luxury sedan segment. It will face the likes of Honda City, Hyundai Verna, Fiat Linea and Ford Fiesta in the Indian automobile market. This latest sedan looks quite elegant, as it has a sleek body structure and attractive cosmetics. Its front facade is fitted with large radiator grille that has horizontally positioned chrome slats, which are further embedded with company's logo. Surrounding this grille is the radiant headlight cluster, which is fitted with projector headlamps and turn indicators . The front body colored bumper has a a wide air dam and a pair of round shaped fog lamps. It has a lustrous side profile featuring expressive lines and trendy features like black B pillars and window frames. Its door handles and external mirror caps are painted in body color, while the waistline molding gets a chrome garnish. Its wheel arches are fitted with a set conventional 15-inch steel wheels, which are covered with tubeless radial tyres. Its rear profile looks as stylish as its frontage, thanks to its wide taillight cluster and boot lid with integrated spoiler. Its tailgate is skilfully decorated with a chrome plated strip and company's insignia. The rear bumper too has a sporty design owing to its reflector consoles with black finish. This sedan is available in seven attractive paint options including Pearl Metallic Arctic White, Midnight Black, Silky Silver, Glistening Grey, Clear Beige, Chocolate Brown and Fire Brick Red. This Maruti Ciaz VXi trim has a classy interior design with black and beige color scheme. The main highlight is its exceptional leg and shoulder space as it has a long wheelbase and width. The instrument cluster has two round shaped meters and a multi-information display featuring sophisticated informatics like tachometer, speedometer, tripmeter, fuel gauge, digital clock and several other warning notifications. Its dual tone dashboard houses numerous advanced equipments including a music system, a climate control unit and several storage spaces. There are a lot of silver inserts given on dashboard, gearbox console and AC vents surround. Furthermore, the steering wheel, door handles and parking lever tip gets a chrome treatment, which accentuates the interiors. The ergonomically designed seats have adjustable headrests and are covered with good quality fabric upholstery. Its driver's seat has height adjustment facility, while the rear bench seat has 60:40 split folding function. In a bid to enhance conveniences, the car maker has given several utility features like roof mounted sunglass holder, a large glove box, cup holders, storage pockets and dual front sun visors. This sedan is powered by a 1.4-litre petrol engine that has multi point fuel injection technology. It comprises of 4-cylinders, 16-valves and is based on a double overhead camshaft valve configuration and can displace 1373cc. This motor can belt out a maximum power of 91.2bhp at 6000rpm and generates a commanding torque output of 130Nm at 4000rpm. This power plant is skilfully mated with an advanced five speed manual transmission gearbox, which transmits the torque output to the front wheels. The car maker claims that this petrol variant can give away a mileage of around 20 Kmpl, which is the best in its class. Its front wheels are fitted with a set of ventilated disc brakes and the rear ones are paired with conventional drum brakes. These are further assisted by anti lock braking system and electronic brake force distribution . Its front axle is fitted with McPherson strut system and the rear axle gets a torsion beam system. The car maker has also incorporated highly responsive power assisted steering system featuring speed dependent control, which provides precise response and makes handling simpler. This Maruti VXi Plus is the mid range variant but it is equipped with numerous advanced comfort aspects. Its cabin is fitted with a proficient automatic air conditioning system including pollen filter and rear AC vents, which keeps the entire cabin pleasant. This trim has a list of features including tilt adjustable power steering, an inside rear view mirror with anti-dazzling effect, electrically adjustable outside mirrors, driver's seat height adjuster, power windows with one touch operation and fabric seat upholstery. In addition to these, it also has storage spaces like cup holders, storage pockets, a glove box, bottle holders in doors and roof mounted sunglass holder. The car maker is also offering an advanced 2-DIN music system that has a CD player featuring MP3 playback along with USB port, 4-speakers and 2-tweeters. This sedan is blessed with a specially designed S-TECH body structure featuring, crumple zones and impact protection beams, which safeguards the occupants in case of a collision. This mid range trim also has a list of features including ABS with EBD, remote central locking, rear defogger, anti-theft security system, projector headlamps, driver airbag and three point seat belts . In addition to these, it also has adjustable head restraints, engine immobilizer and numerous other such features. 1. Comfort features are at par with other sedans. 2. Initial cost of ownership is quite competitive. 1. Alloy wheels can be given as standard. 2. Lack of rear parking sensors is a disadvantage.